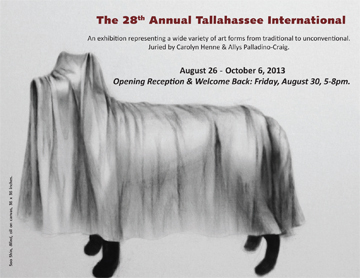 Please join MoFA for the CVAT&D Welcome Back and opening reception for The 28th Annual Tallahassee International this Friday, August 30th from 5-8pm. The Tallahassee International will be on exhibition through October 6th. The museum is also hosting: Living the Landscape: Animated Beings in the Multisensory World of Peruvian Ceramics and Textiles, The John and Mary Carter Collection through November 17th and New Acquisitions from the MoFA Collection through September 15th. Closed: Monday, September 2nd for Labor Day. Know someone who would be interested in Museum exhibitions and events? Please share!